Nordic ID is organized by the Project Baltia magazine. In fact, Nordic ID can be considered an extended version of the magazine as if there was not enough space on paper, so it decided to show part of its material live. 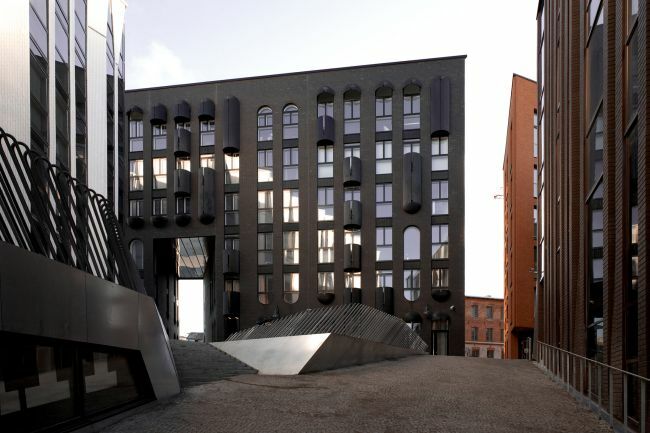 Project Baltia is about architecture and design, as one can assume from its name, and same is Nordic ID about. It is sort of general outlook on Baltic identity. Exactly so, outlook on what this identity looks like, how does it express itself visually, what is this northern style in general. What exactly in the field of architecture and urban planning raises a thought “Oh, this is very Scandinavian”? Five curators were invited to the project to represent the Baltic countries: Daniel Golling, chief editor of FORM magazine, from Sweden; architect Anders Melsom from Norway; Martin Keiding, chief editor of Arkitekten magazine and juror of Danish biennale Europan 11, from Denmark; establisher of architect and urban planning bureau NOW Tuomas Toivonen from Finland and vice-president of the Union of Estonian architects Villem Tomiste from Estonia. Each curator had challenge of choosing five most emblematic architectural designs in his country. The final result is not coordinated by anyone: curators were working separately from each other, so the entire picture stays unknown until puzzle is put together. In fact, Scandinavian style has quite recognizable international image. What kind of features are associated with everything made in Scandinavia, and not only professionals and connoisseurs, but whoever who visited IKEA? Minimalistic lines, very simple but perfectly polished shape, reliability and performance, environmental and user-friendliness. However, the task of Nordic ID is not as easy as it seems. It is still a professional project, and just one more version of IKEA bedside chest is not enough. Curators have much more mature questions to answer. For instance, how can we talk about national or regional identity today, when urban planning has gone so global, and architects from around the world build away around the world, whether these are Swedish designers in Korea or Japanese in Rio de Janeiro? How do we separate national colors from global trends when they are so aesthetically similar? With existing stereotypes of Scandinavian style, what can be considered its development and what is already escape to the new aesthetical platforms? I mean, if I carve the edge of this cube, is it still Scandinavian or not anymore? And what if the carving is gild? Last two questions seem to be a joke, but they are essential in Russian design space. Russian designers gladly produce fine minimalistic and high-tech works, even get awarded for it, however, in a non-exhibition area, in common everyday architectural space luxury trend still rules the day. Recently, head of a molding and interior accessories company to hold master classes for loyal customers, was wondering how come designers don’t care much about Italian classic style master classes. Allegedly, because they make all these pillars and twirls themselves all the time, however lectures of minimalist Scandinavian artists raise a lot of interest. A certain part of Russian customers (and we know that both architect and designer are always customer’s hostage) yet has to comprehend that rich doesn’t necessarily mean gold and diamonds. The mission of the Project Baltia magazine, organizer of Nordic ID, is educational in no small measure since its target group is practicing architects and designers. However, the project is professional, and created for professionals, thus it is deeper than mere “minimalism – reliability – environment”. It allows us to follow the evolution of Scandinavian signature aesthetics, different fluctuations within its field, it presents Northern design as more versatile and elastic than its square-shaped stereotype. There is Älvsjö district in Stockholm: not only it represents classical Functionalism, it is sort of grotesque: grey walls growing together with grey sky, straight lines, box-houses, surely very comfortable for living. And here is a dwelling house in Rottermanni district in Tallinn: also a box, but its window pattern creates its own whimsical rhythm and even its grey color is elegantly dark as if the color was means of expression. 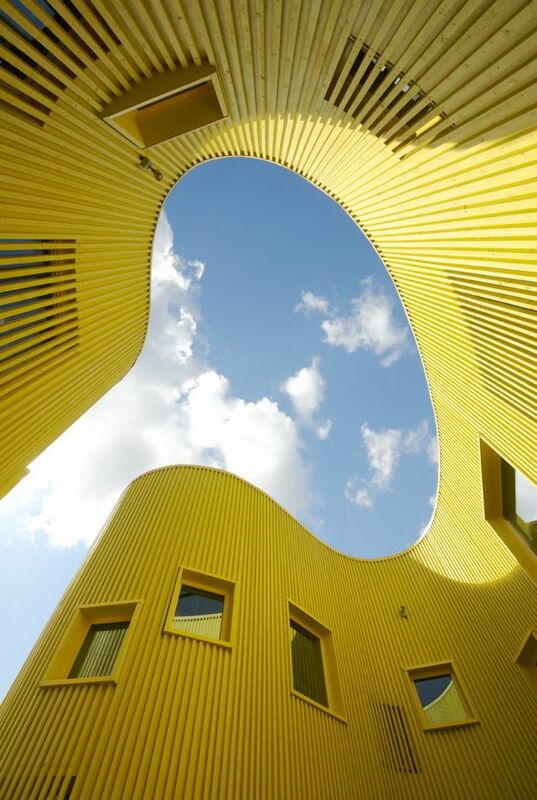 There is the building of Tellus kindergarten in Sweden: looks like a paint barrel from the outside, but the interior is filled with flowing lines and warm sunny colors. Norwegian villa Borgen/Nilsen: laconic dark brick would look like a simple trailer if it didn’t levitate on the glowing pillow of all-glass ground floor hall. Truly unreal pedestrian Skoone bridge in Tallinn is one of fully artistic projects. Another one is landscape hotel Juvet in Norwa: glass and stone capsules thrown around in the rocks transforming the environment and themselves in it. The strongest side of Northern architecture is affection towards nature, ability not only to avoid conflicts with it, but growing architecture right from the landscape, making it an object of art, and this truly Scandinavian feature is very well shown at Nordic ID. Nordic ID is not limited by just an exhibition, it creates live environment where its spectators can evolve and mature, and it is the main value of the project. Within the framework of the project three of its curators – Golling, Melsom and Tomiste – hold master classes and lectures. Nordic ID also makes a direct opening into urban planning practice: closed competition for conceptual design for the reconstruction and building the lot in the centre of St. Petersburg. International competitors from Russia, Finland, Sweden and Estonia and international committee give Baltic design a chance to become permanently represented in the city.